Hi Friends! I'm still stitching away on custom quilt orders. I got to work on one of my projects yesterday, a graduation gift for a friend of Maddie's. I finished the top yesterday. The pattern is "Coming Home" from the book, Simplify by Camille Roskelley. I have made this quilt before. It is a simple pattern that gives big results. I added more blocks and wider borders to make the quilt throw size, a 54" square. Today I hope to get it pinned for hand quilting. Hope you are having a good day, the sun is shining brightly here! 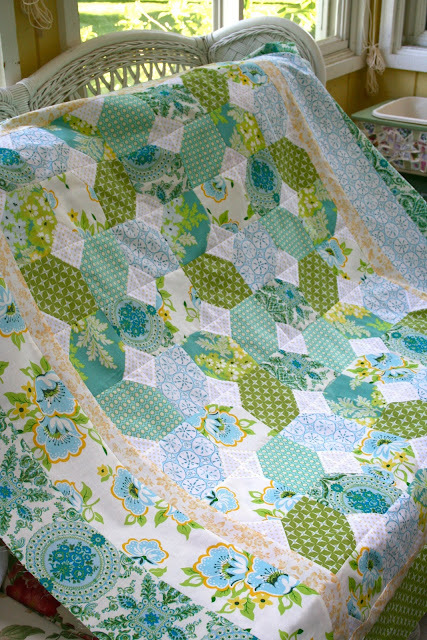 I love this quilt Renee! The colors are my favorite- blue and green! Great job on it- it looks fabulous! you are such a talented lady! Love this quilt! Colors are perfect and the pattern, while simple is very effective! It'll look so nice when you've finished quilting it! Nice! Wow Renee, this quilt is gorgeous!! Love this, your fabric choices are amazing! I have the same book and Iwould have never thought about those fabrics for it. You are very talented!! Love this quilt! It is so fresh and contemporary looking. It will be a wonderful gift! WOW is that cool. Just love the design, u r amazing. That is such an interesting pattern--very simple with big 'punch' factor! Like the use of white. I have just the perfect fabric for this one.....thanks HEAPS!!!! So lovely, Renee! The colors make me happy! Such a pretty quilt. Lucky graduate! I love the quilt color combination and the pattern. Really lovely! Such pretty fresh colors. A nice gift for the grad. Be sure to post a picture when it is done and quilted. What a lovely quilt! I love hand stitched quilts the best. Looking forward to seeing the finished product and I'm sure this young lady is going to love it! !